The system will automatically provide the number of repayments based on your pay frequency (range between 42 to 62 days). Only the 1-repayment option is available in Manitoba. Please note that in Manitoba only the 1-repayment option is available. If you take a loan with us, you will have to repay it on your next pay date. Express loans are instant online personal loans that can provide you the funds you need quickly, securely and efficiently. When you need money fast and cannot wait, there’s often no better choice as you’ll usually have the money within an hour. They can be a real lifesaver. These type of express payday loans can quickly provide you with the funds you need, without restriction on how they can be used. Unlike traditional credit applications, the loan application process, approval, and funding for instant loans online are super-fast. Speed and convenience are the hallmark for these kinds of loans, making them a perfect fit for the way most Canadians live their busy lives. Read on to learn more about the benefits of express payday loans online and how you can get approved for them from a licensed, trusted industry leader. It always seems like surprise bills and expenses pop up when you least expect them. One minute, everything’s going great, and the next thing you know, you’ve got a major financial headache. Maybe your refrigerator decided to stop working, or your heater just stopped working in the middle of a harsh cold Canadian winter. Even good surprises, like an engagement or your child getting interested in a new sport can all result in unplanned expenses that can put a strain on your finances. Naturally, when money is tight, Canadians turn to rapid loans for fast, easy access to the funds they need. That’s just not helpful when Canadians need emergency loans. Your money needs are urgent, and your money lender should be just as quick in approving you for the funds that you need. Online loans take just minutes to apply for and get you the cash you need the same day. Customers can obtain quick easy loans from iCASH and receive up to $1,500 in under an hour. Now that’s fast and all your financial obligations can now be met. In the time it takes to read this page, you could complete your loan application and get approved. That’s the power of quick money loans, getting you the funding, you need as fast as possible. With a cash express loans, you can choose your loan amount, preferred repayment options and if you qualify, get instant approval. There’s no minimum credit score requirement, either. In fact, many of our clients apply for personal loans for bad credit and get approved. Applying is easy and doesn’t influence your credit. Since the loan application is completed online, you can apply 24 /7, day or night. Online loans with instant approval provide you the funds you need via e-transfer within 5 minutes after being approved. The loan is then repaid automatically based on your chosen repayment plan. Everything is clearly spelled out in your loan agreement. As a company, we are committed to transparent lending, letting you know the full cost of borrowing, without any hidden fees. It’s really that simple. With express loans, you’ll get your money fast so you can quickly get back on track with living your life. Get up to 20% in Cashback! iCASH offers a unique Cashback program to reward its customers. You can get back up to 20% of the cost of borrowing paid once your express loan is repaid and receive your Cashback direct into your bank account the same day. Real saving and real Money! Sign up with our free app and access your account anywhere. How to apply for an Express Loans? Start your express loan online application and provide basic information, choose your loan amount, terms, and hit submit. Our software will review your loan application and provide a decision almost instantly 24 / 7. Sign your loan agreement and send it back to us. Your money will be sent within 5 minutes via e-transfer. Express loans online are the perfect choice when money is needed urgently. Traditional loans can take quite a bit of time to apply for, get approved for, and ultimately to receive your money. The wait can be extremely stressful in and of itself and the delay between when the funds are needed and when you get them can wreak havoc with your finances. That’s why more and more people are gravitating to instant money loan. The entire process can take less then 30 minutes. That’s less time than it would take to drive to and from a bank or traditional lender in many cases. Because we provide express loans and use advanced software for the loan approval process, our speed can’t be beat. Applying for an instant payday loan is one of the fastest and easiest ways to borrow money in Canada today and it’s even faster after your initial application as your information is saved to your account, so applying in the future for a rapid loan takes just a few minutes. Now that’s what you call fast loans. iCASH offers affordable express loans online with an easy online application, speedy service with a funding process that’s incredibly easy and convenient. If you’ve ever made a purchase online and filled out a shipping form, you’re totally ready to apply. That’s because that’s really all it takes, a few online forms, clicks, and you’re good to go! The entire application, approval, and funding process takes place online. There’s no branch to visit. There are no document requirements, and you never need to fax or mail anything to us. Likewise, you don’t need to worry about sending in a check for repayment – it’s all automatic. All of those things save you time, of course, but also offers you tremendous convenience. We’ve made a great effort to make the entire process for our instant approval loans as easy as possible. You can apply from anywhere, at any time, on your schedule, and get cash when it’s needed most. Speed, convenience and quality, a winning combination. In an effort to deliver on speed, express loans are entirely flexible and customizable. You choose the amount, from as little as $100 to as much as $1,500. You also have the flexibility to select a repayment plan, either a single, lump-sum repayment, or 2 or 3 payments. Pick the option that makes the most sense for you and your unique financial situation. By offering the best online payday loan service, we don’t charge you more for choosing the payment plan, either. We want to help you improve your finances, pay your bills, and live a better life. That’s the whole point of quick money loan in the first place. Can I get an express loan fast with no credit check? Most payday or express loans that advertise “no credit check” still require you to do a lot of work. You have to visit a lender’s office location, fill out a lot of paperwork, provide proof of your income and other information, and more. Then, you have to sit around, waiting for your approval and your money. All that effort and waiting is frustrating, especially when cash is needed quickly – the whole point of a quick money loan in the first place! iCASH offers an alternative to this old, outdated method of obtaining loans. You don’t need to visit an office – there are none! To borrow money quickly, just complete the loan application online, your smartphone or the payday loan app. It takes just minutes. Approval decisions are fast, too, so there’s no waiting. And receiving your money? That’s also super-fast, with e-transfers available within 5 minutes following digital signing of your loan agreement. How does an Express Loan affect my credit? Express loans do not directly have any kind of influence on your credit score. The traditional credit reports at the major credit bureaus don’t record or track these kinds of loans. And, when you apply for them, it doesn’t affect your credit score, either. However, certain types of credit history reports from specialized credit reporting agencies may capture data about your loan history. It can then be used and referenced by lenders when you apply for other type of loans down the road, but it does stay off your regular credit report and score. Another way in which these types of express loans can affect your credit score is if you fail to repay the loan on time. If your loan goes to a collection’s agency or debt collector, then the debt and delinquency is usually reported to the major credit bureaus. This is the only way that a payday advance loan will impact your credit score and it’s entirely preventable. Simply pay back your loan on time, as agreed to in your agreement. Then, you won’t run into any problems with your credit report or credit score. How to qualify for an express payday loan? How can I get an express loan with bad credit? Can I get an express loan the same day? Which loan company is best for express payday loans? Who can I contact regarding my express loan? If you meet the basic requirements, then you’ll qualify, and express loans online are the perfect choice for you. All you have to do is to start filling out the application online! You must be at least 19 years old. You must be a Canadian citizen, residing in one of the provinces we service – specifically Alberta, British Columbia, New Brunswick, and Ontario. You must have been receiving the same source or mix of income for at least the past 3 months. You must have a net income of at least $800/month. Own a Canadian bank account, opened for at least 3 months, with access to online banking features. Have a valid mobile phone, email address, and home address. There are no minimum credit score requirements to get an express loan. While a credit check is performed as part of the approval process, it’s just one of many things that we look at and having bad credit is not disqualifying. Even if you have limited or bad credit, that does not stop you from getting a quick money loan. We believe that you’re more than just a number. Too often, credit scores are used as a substitute for thorough vetting and analysis of potential borrowers by online lenders. Our main consideration in the lending decision is whether or not you have the financial means to repay your express loans. We don’t believe you should be excluded from getting the urgent funds that’s needed because of your credit history. While no lender can offer guaranteed payday loan approval, we can promise you that we will never reject your application solely based on credit score. With an express loan in Canada, you can get the money you need that same day any time of day, any day of the week, any week of the year. Since everything is done online and is automated, round-the-clock service is possible. You can apply whenever you want, and your approval is handled by our software. The loan agreement is made available digitally and requires only a digital signature that takes just seconds to complete through our website. And then the funds are released so they’re available that same day, not just during traditional “bank hours.” If you choose the e-transfer option, funds from express loans are available in 5 minutes following receipt of your signed loan agreement. They’re not called “express” for nothing! 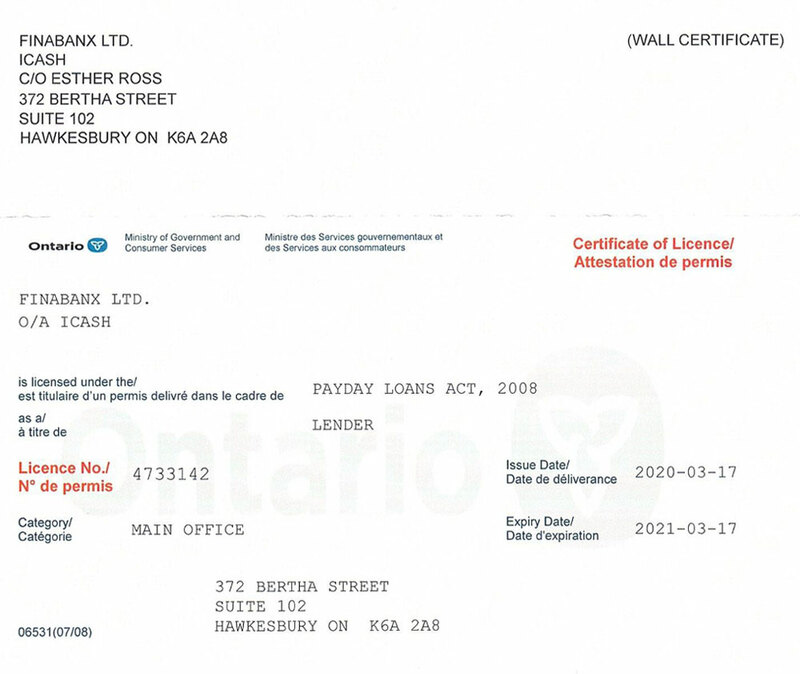 As a leader in the industry, iCASH is considered the best online express payday loans in Canada. It is the preferred choice for many of our customers, for a variety of different reasons. The speed and convenience as well as affordable competitive interest rates are two more reasons. As a bonus perk, a cash back rewards program that is very appealing to many customers. But beyond all that, a commitment to quality and service. We want to grow a relationship with you as a customer. 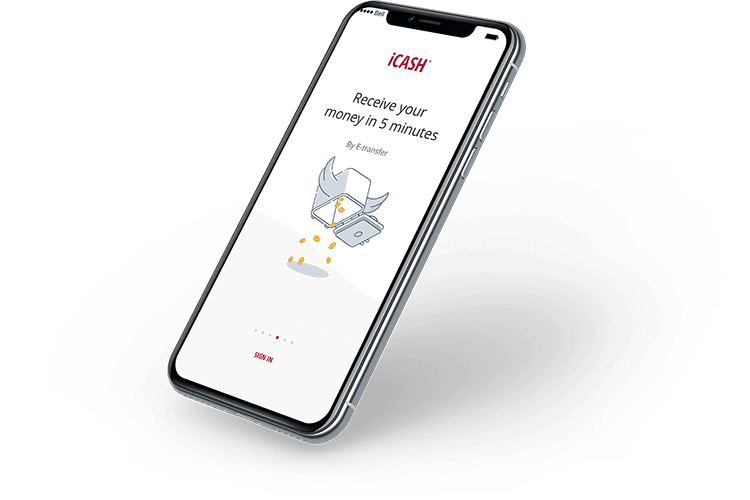 When you choose iCASH, we want to earn your trust, respect, and keep you as a customer. 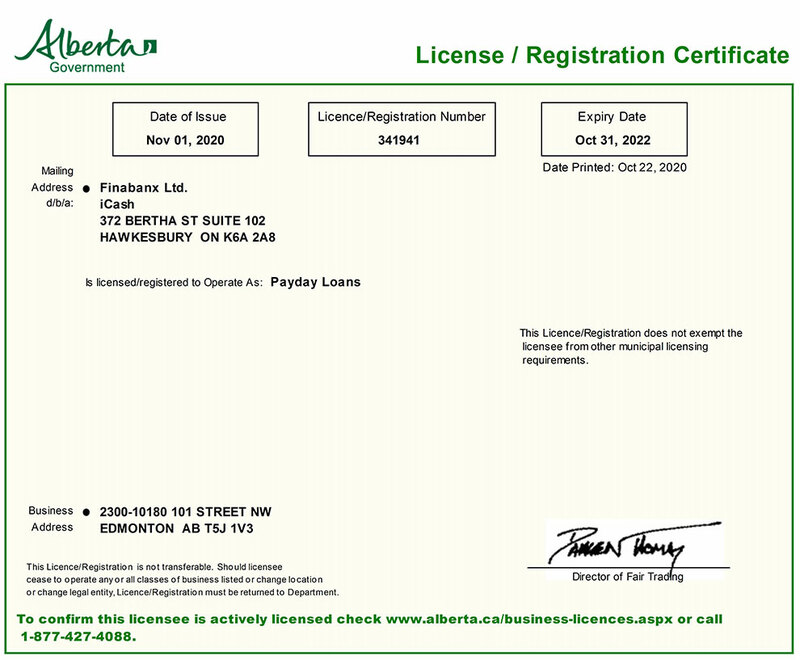 Towards that end, iCASH is a licensed and certified direct-to-consumer lender. That means we’re regulated by the provincial government authorities in every province in which we operate. Many of our competitors can’t say the same which leaves many consumers with little protection and little recourse if there is a dispute or issue. As a Canadian based company, we comply with all Canadian laws, embodying Canadian values like trust, honesty, transparency, ethics, and responsibility. We’re here to earn your trust and serve Canadians with all of their needs. A team of dedicated and knowledgeable customer experience advisors that are available by phone and e-mail to help you. We also have an online knowledge base of articles and payday loan FAQs that answer the most common questions about your options when it comes to express payday loans. Most people find the answers they’re seeking within these resources, which we provide for your convenience. So much of our online lending process is automated, that we figured a help option should be as well. But we recognize and respect that sometimes, you just need to talk to a real person. Please, feel free to reach out and contact iCASH, and we’ll be happy to address any questions, concerns, or issues you may be having. Our team is based in Canada and speak both official languages. They are available from 9 am to 9 pm Eastern time Monday to Friday, 9 am to 5 pm Eastern time on Saturdays, and 12 pm to 5 pm Eastern time on Sundays. and others). Easy online payday loans in Canada, Same day fast cash Ontario ON, Online loans British Colombia BC, Cash money Alberta AB, Payday loan Saskatchewan SK. A payday loan allows a person to get cash for a short time period against his or her next pay cheque. A customer with an active chequing account, direct deposit and a job can receive funds in his or her account in less than one hour. iCASH does not automatically renew loans. iCASH encourages responsible lending. Failure to repay your loan will result in a negative report to the credit bureaus, which would significantly reduce your credit score. If you do not repay your entire loan on or before the loan due date, the loan will be considered unpaid and will be subject to a fee of up to $48 depending on your province. In addition, interest will accrue on any unpaid balance at a rate of 59% per annum. Delinquency will to be taken up in court and you will have to bear all the court, legal & administration fees. 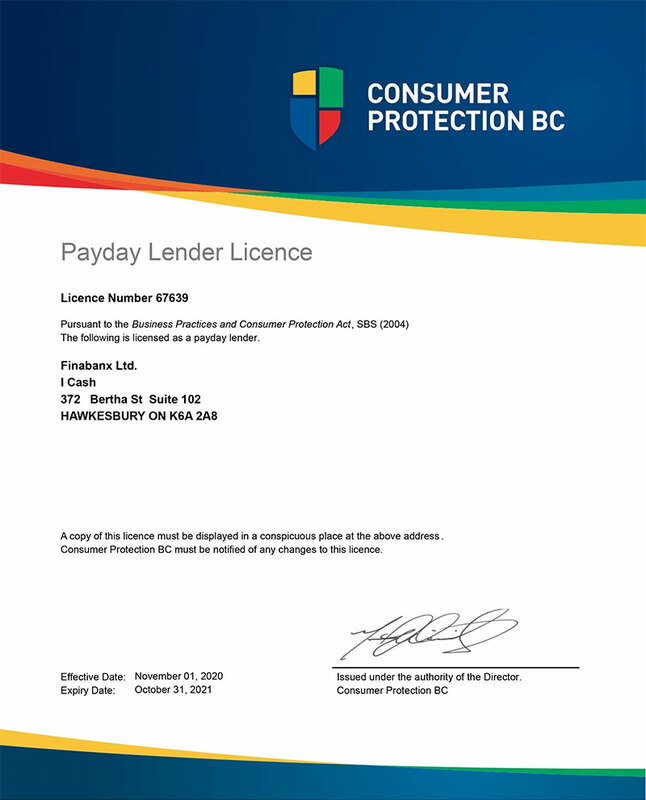 iCASH is a short term loan responsible lender that is guided by provincial consumer protection laws. We are fully licensed, transparent and 100% compliant in all Canadian provinces. Educational materials related to the Payday Loan industry are available for download. If you wish to obtain copies of educational material approved by the Registrar, Payday Loans Act, 2008 please click here. Maximum charges permitted in British Columbia for a payday loan: 15% of the principal. We charge 15% of the principal. This information meets the requirements of the Business Practices and Consumer Protection Act. We charge $15 per $100 lent. This information meets the requirements of the Fair Trading Act. Cette affiche est conforme aux exigences de la Loi sur la communication du coût du crédit et sur les prêts sur salaire. For educational tolls please click here. How much will $300 cost you for two weeks? *This example shows what borrowing multiple loans would cost. You cannot hold more than one payday loan at a time. You cannot pay off a payday loan with another payday loan. Combien vous coûtera un emprunt de 300$ pour deux semaines? *Cet exemple montre ce que coûterait l'emprunt de plusieurs prêts. Vous ne pouvez pas détenir plus d'un prêt sur salaire à la fois. Vous ne pouvez pas rembourser un prêt sur salaire avec un autre prêt sur salaire. **Au Nouveau-Brunswick, le coût total maximal du crédit autorisé est de 15$ par tranche de 100$ en vertu d'un prêt sur salaire. Please note that we do not operate in Québec.